Review by Ironheart on 4/2/2012. Review by Dogfish44 on 3/21/2012. Most definitely a map with flaws, there are many issues. The first thing you'll notice is the map is aesthetically appalling, with large gaps between countries where there should not be gaps, and the number boxes not being of the correct size. In detail, the NorthIslands (Yes, the bonuses don't have spaces in there names), nowhere near enough research was done. They are actually called the Jason Islands, and 3/4 of the unnamed islands are names - Flat Jason Isle, South Jason Isle, and Elephant Jason Isle. 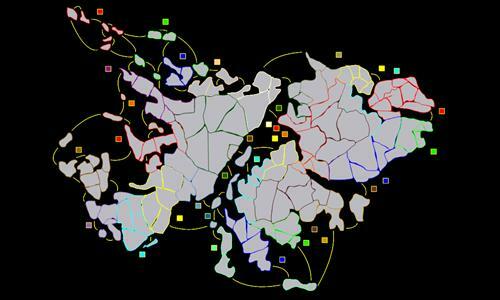 Heading over to the RiverPlains bonus area, the red bonus in the north east, we see the large territory "Centerra de Arena" is missing 2 links - to "Douglas" and to "Rookery Bay". This map is, to be frank, unplayable. Review by ChrisCMU on 5/24/2012. Several connections are missing. Makes gameplay horrible. It is a shame since the land masses provide an interesting game. Review by SlyMonster on 5/25/2013. Review by INSIDE on 8/17/2013. Review by Anwil on 10/2/2014. Review by Nathan on 5/8/2015. Tough and lots of fun. I noted one improper connection - Sands Pond should not connect to Open Ground (the one surrounding Port Howard) in the CentralWestIsland region. Review by Ranth6622 on 3/27/2012. Review by AcetheAwesomeApple on 7/5/2012.